Heat a over med-high heat. Add oil. Cut chicken breasts into bite sized pieces. Add to saute pan and saute them until they are browned. 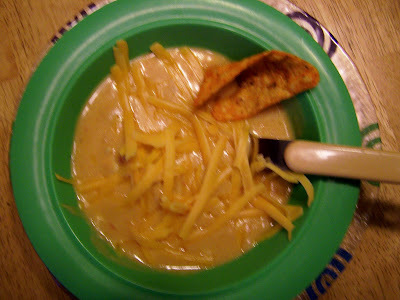 Add soups, enchilada sauce, and milk to a medium saucepan. Whisk until well-blended. Add chicken to mixture. Bring to just a boil over medium heat, stirring often. Be careful!! It will burn onto the bottom!! We like to serve this topped with a little shredded cheddar and tortilla chips on the side. They are good crushed and added to the soup, or used as scoops for the soup. YUM! Sounds good. I doubt my kidlets would eat it with the enchalada sauce in it though.... Maybe for a future lunch bunch where other Mommy's can eat it with me? Sometimes, it's OK to be a follower. Wife and mom of three. I love to cook (and eat). I am also trying to please my family, lose weight, and make stuff that tastes GOOD. I love to exercise. I run, spin, and do a fantastically impossible local muscle work class.